I've talked a lot of talk about this navy pea coat from Aritzia, but I wanted to show you how I walk the walk. A big part of my initial attraction to this kind of outerwear was just how it looks on it's own: classic, masculine, and simple. I didn't anticipate how easily it would jump into rotation in my wardrobe, which, when the weather is above 35 degrees is pretty much daily. This particular jacket also happens to fit me like a glove, so if you're looking for something similar, I'd shop around for one that really flatters. Pay attention to the shoulders, where it hits you on the hip and the width of the lapel. This particular coat is no longer available on Aritzia's web site (sad!) so you might try this one (on sale!) from Uniqlo, this cropped cutie from Club Monaco, or a more feminine take from Juicy Couture. So gorgeous and classic lady! I love the shape of the coat with your flared jeans! Great looks. 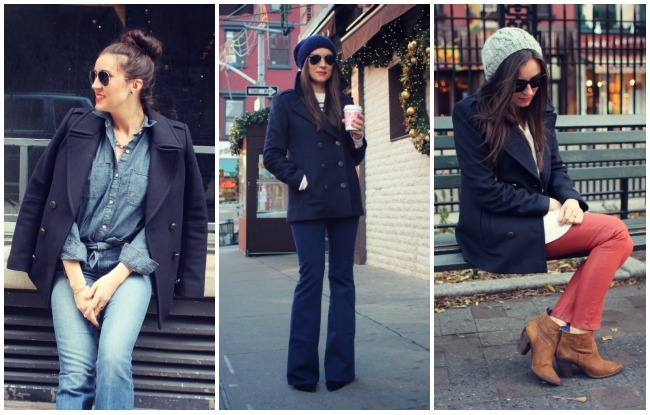 & I agree - I LOVE my navy pea coat. It's classic and goes with pretty much anything. That is definitely a classic pea coat. I love it in the second look with the flared jeans. By the way, your blog name is fantastic and funny! wish that i had snagged this before it sold out- really cute on you!